In preparation for the festival, which starts tomorrow and runs for nine days (Oct 1-9), all 24 participating Chinese shrines will be consecrated, particularly the shrine’s kitchens which prepare vegetarian food for devotees throughout the festival. 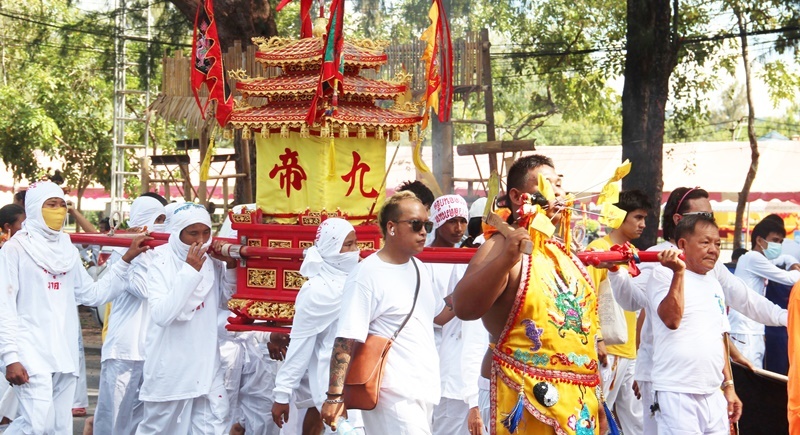 During this time, demons, or orphaned souls, who have been won-over by a Taoist Master and are therefore able to take the first step on the ladder of merit leading to heaven, are symbolically released and are said to protect the community for the duration of the festival. Following this, a lantern-pole raising ritual will take place at each shrine. The lantern poles feature nine oil lanterns, symbolizing the Nine Emperor Gods, who are said to descend down the poles into the shrines at midnight, marking the start of the festival on Oct 1. During the festival participants dress in white to symbolize purity and adhere to a strict vegan diet to cleanse their bodies. Other rules for the festival include maintaining virtuous behaviour, imbibing no alcohol or drugs and people who are in a state of mourning, pregnant or menstruating are prohibited from taking part in the festival. Perhaps the most striking feature of the festival is the numerous street processions conducted daily by the different shrines. These processions offer an opportunity for the general public, who line the streets during the processions, to receive the blessings of the gods possessing the spirit mediums or Ma Song. The Ma Song – those who will allow spirits to possess them, mortal mediums – are famous for their gruesome displays of flagellating their flesh with axes or maces and inserting a variety of artefacts, such as knives, skewers and even guns through cuts in their cheeks or hanging them by hooks from the chests or backs. Ma Song claim to feel no pain during these acts and say that the gods that inhabit their bodies protect them from harm. 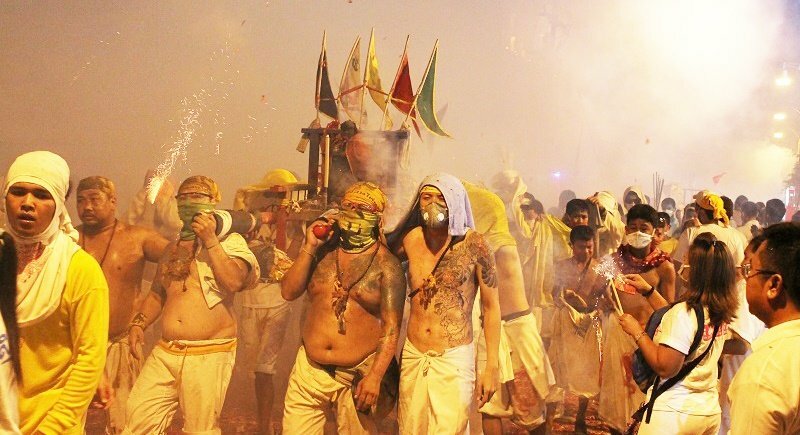 Other spectacular displays by devotees of the Nine Emperor Gods include fire-walking, bladed-ladder climbing, hot oil bathing and “nail-bridge crossing”, which will take place at various shrines across the island during the festival. 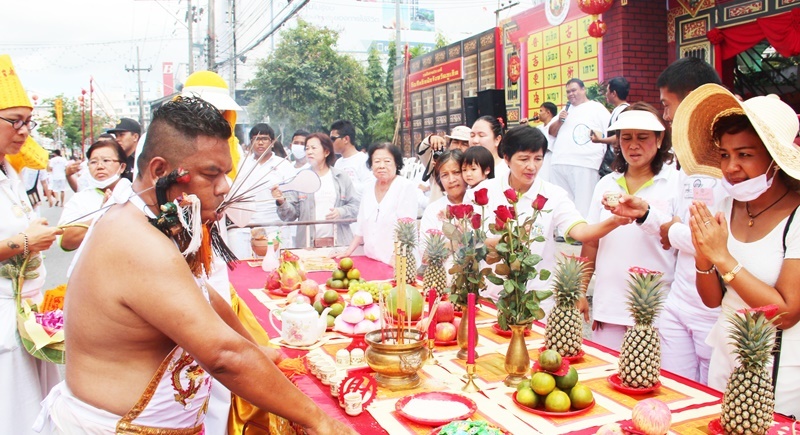 The last ceremony of the Phuket Vegetarian Festival (Oct 9) is certainly the most impressive. 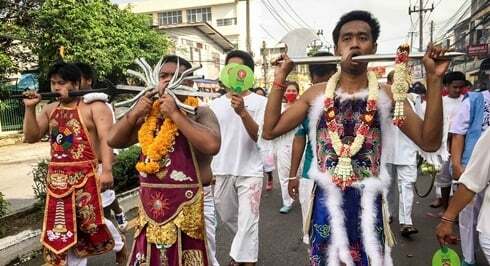 Between 9pm and midnight, all shrines join a street procession from Phuket Town to the sea at Saphan Hin to farewell the Nine Emperor Gods as they re-ascend to heaven. So if this is your first time in Phuket during the festival, make sure you take the opportunity to witness this ancient tradition which is a unique and spectacular example of Phuket’s rich culture and history. Attention: You are approaching a bodily fluid spray zone. Please wear a full-body condom or risk myriad communicable pathogen. I suggest a new name for this festival; The Look At Me, Look At Me, LOOK AT MEEEEEEEE Fest- A Celebration of The Immature Male Ego.